Alfalfa promotes general health as well as lipid and carbohydrate metabolism. 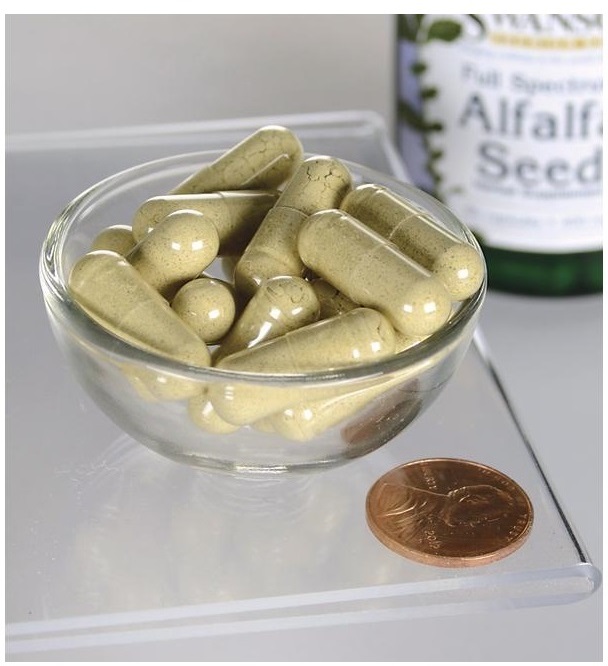 Many people brew alfalfa tea, but Swanson Full Spectrum Alfalfa Seed capsules make taking this herb simple and convenient. Alfalfa is one of the oldest cultivated crops and has been part of dietary and healthcare practices for centuries. Alfalfa is used for various purposes at almost every stage of its development, from seed to sprout to leaf. WARNING: Do not take this product if you have lupus. There are a number of impressive HEALTH BENEFITS associated with alfalfa, including its ability to lower cholesterol levels, improve digestion, protect heart health, prevent cancer, improve respiratory conditions, detoxify the body, aid immunity, speed healing and reduce inflammation. Respiratory Health: Traditionally, alfalfa was widely used in the treatment of respiratory conditions, such as bronchitis the flu and the common cold, as well as other viral and bacterial infections. Alfalfa has anti-inflammatory ptoperties, which made it useful in treating various breathing conditions, such asthma, while also strengthening the immune system to neutralize the underlying infections attacking the respiratory tracts. Protect the Heart: Potassium and iron are both found in significant supply within alfalfa, and these benefit the heart in different ways. Potassium is a vasodilator which helps to lower blood pressure by releasing the tension on blood vessels and arteries. Furthermore, the iron content of these sprouts boosts red blood cell production, thus improving circulation and ensuring that the body’s organ systems are properly oxygenated. This puts less strain on the heart because the extremities will be demanding less blood and oxygen from an already overworked heart.